I am sure that you know something little about pearls, for example that emancipated Coco loved them or that in the 16th century they went mad and even named an entire period after them. Som si istá, že o perlách niečo málo viete, ako napríklad to, že si ich zamilovala a považovala za vrchol elegancie emancipovaná Coco a že sa po nich išli zbláznit v 16. storočí a pomenovali po nich dokonca celé obdobie. Do you know something more about pearls? Something interesting? Let me know. Viete o perlách niečo viac? Niečo zaujímavé? Napíšte mi. Moc pěkná sbírka, taky jsem na "perlách" (kéžby opravdových perlách) závislá. Jinak myslím, že se tomu povolání říká lovec perel, ale možná existuje i ten tvůj termín. This post is like a treat for my eyes! I am so obsessed with pearls! Definitivamente as pérolas são as nossas melhores amigas! Combinam com tudo e tornam.nos lindas! Very impressing collection of stunning pieces! I love pearls and I do wear pearls myself. I like to combine pearls with silver jewelry, they just let your outfit look special. For me pearls will never be old fashioned. I love pearls too and the different colors that they come in.They are one of my favorite kinds of jewelry because they look so classic. They're lovely! 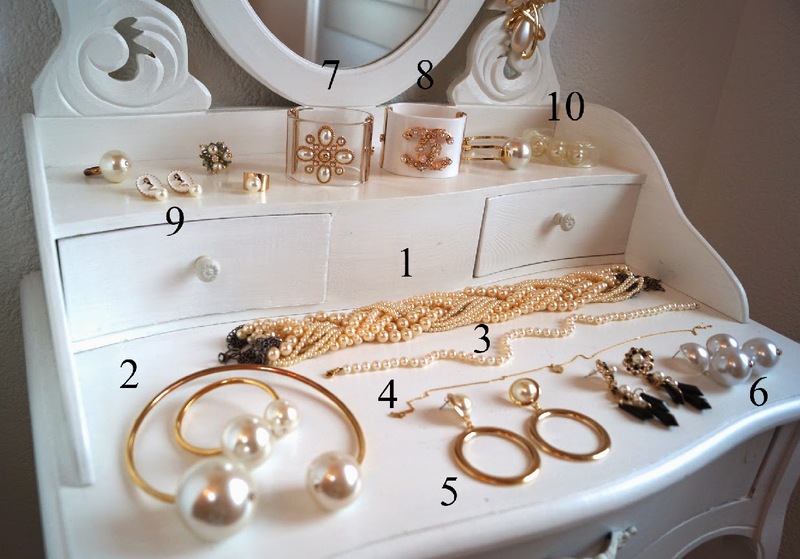 I want a desk full of jewels like that!